This capability involves the exposure of advanced production or storage alloys to hydrogen atmospheres along with extended analysis capabilities on physical and microstructural evolution along with mechanical performance. As a hydrogen-specific capability in the INL Environmental Effects Laboratory, the suite of capabilities includes controlled exposure to flowing pure hydrogen at varying temperatures and mechanical testing in a vacuum environment. This work has extended to the establishment of capabilities in characterization to preclude exposure of specimens to reactive environments through bulk electropolishing and specimen transfer via portable glove box systems for detailed electron backscattering diffraction (EBSD) analyses, which are highly dependent upon specimen surface quality. Prescreening of candidate alloys for the production process that will be exposed the harsh hydrogen-rich environment at elevated temperatures could be carried out using this suite of property/performance equipment that was designed for studies involving hydriding of nuclear fuel cladding. Specimen sizes are limited to volumes that can fit in the hot zone of a 2-inch tube furnace. 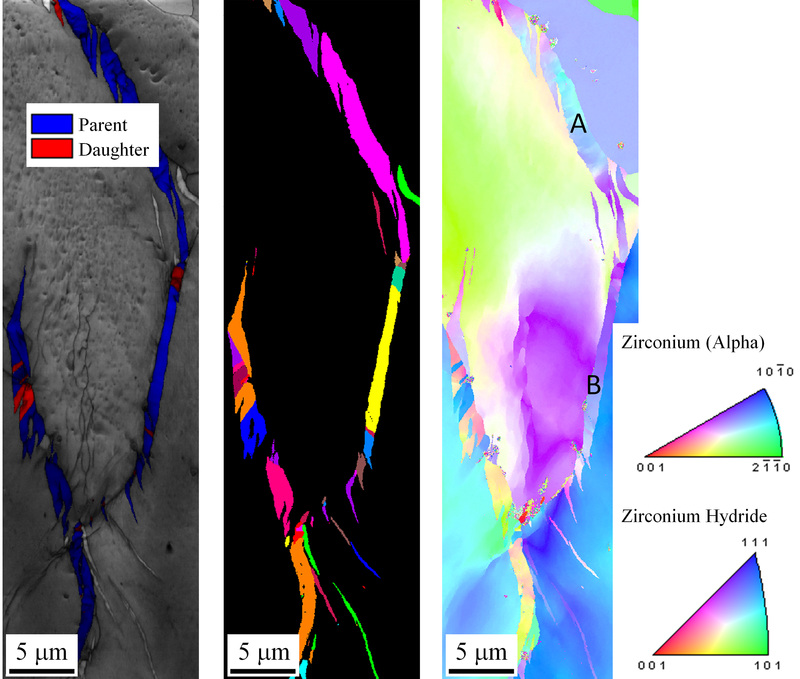 These capabilities were established for fundamental studies on hydride formation and reorientation under stress with specific regard to zirconium-based nuclear fuel cladding. This required the development of strict protocols for exposure and handling due to the relatively reactive nature of the alloys to hydrogen- or oxygen-rich environments. These test protocols have established a particular ability to handle a wide range of different alloys that would be exposed to harsh environments during the production process. The Environmental Effects Laboratory is located in the INL Research Center. Access is limited, but permission is easily granted to students, interns, or visiting scholars that are involved in collaborative research. For contracted research, experienced technicians can utilize the equipment and perform sample preparation and characterization with no added equipment charges outside of microscopy. This capability can screen advanced alloys for harsh environments associated with hydrogen production, both quantifying material performance and uncovering fundamental microstructural mechanisms. Orientation mapping of extended hydride structures in zirconium exposed to a pure hydrogen environment at cycling elevated temperatures. Carroll, M.C., M.R. Tonks, T.M. Lillo, B.S. Fromm, D.C. Haggard, T.C. Morris, W.D. Swank, T.L. Trowbridge, and L.J. Carroll., "Characteristics of Interconnected d-Hydride Precipitates in Zirconium," (in submission).